IS IT ALL OVER FOR QUETTA? Gladiators 7 down for 65. 50-Run Partnership between Elliott & Zulfiqar. This is an incredible fightback. Despite an epic collapse, @TeamQuetta en route to matching or even crossing the total from the first match! GAME ON. 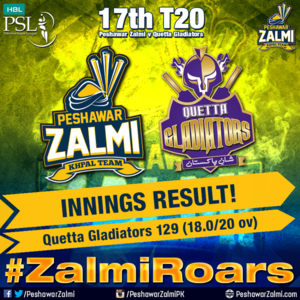 #QuettaGladiators 129 All Out. Peshawar Zalmi to chase 130 in 20 overs. TOP OF THE TABLE CLASH! What a superb performance by the #PeshawarZalmi bowling squad! Career best performance by the one & only #BoomBoom @SAfridiOfficial !